Powers/Abilities: She was a normal woman, probably very skilled in disguise, spying, luring, lying, killing, etc. She was good in her work as a spy and very good in her work as killer. Her husband and her were immediately recognized by Captain America as two well-known spies. (Young Men#25 (fb) - BTS) - Lupa Lupoff was a Russian Spy, but she had a second secret identity: the Executioner. As the Executioner she killed many, including all the spies who failed their mission. Not Arnold, her husband, even knew her second identity. (Young Men#25 - BTS) - Lupa Lupoff had to steal the secrets of the Atomic Cannon built in a desert zone of Nevada. In this mission she was helped by Arnold, her husband. She met Jim Slade, the inventor of the cannon, and had him fall in love with her. (Young Men#25) - Arnold and Lupa learned that Captain America would be protecting the secret of the Atomic Cannon. (Young Men#25) - Captain America luckily saw a photo of Jim Slade's girlfriend and recognized her as Lupa Lupoff. 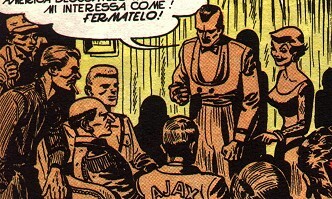 (Young Men#25) - Lupa and Arnold explained the plan to their men, to set traps for Captain America if he would arrive. Later, Lupa Lupoff met Jim Slade at a restaurant in Las Vegas. Arnold was disguised as a waiter. They drugged Slade and brought him away in a car. Their men saw Captain America following the car and tried to stop him but Captain America made them talk. Lupa Lupoff and Arnold brought Slade to the Experimental Zone of the Cannon, to force him to reveal the secrets. Bucky jumped down the car's roof and hit Arnold, but Lupa knocked him down. Although the two spies told Slade that Captain America was dead, he didn't want to speak. Surprisingly, Captain America arrived on the scene before the spies killed the prisoners. 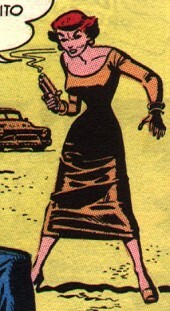 The Executioner, understanding that the spy mission had failed, shot at Arnold without mercy, revealing to him her secret identity, then accomplished her last mission and shot herself. Not long after, an atomic explosion hit the zone. Executioner in Russian is Palach. Comments: Created by Stan Lee?, John Romita?, and ???. any other "Executioner" or "Lupo" or "Wolf" or character with a similar name. any other "Slade" or character with a similar name. Arnold was a Russian Spy. Lupa Lupoff was his wife. (Young Men#25 - BTS) - Lupa and Arnold had the mission to steal the secret plans of the Atomic Cannon. (Young Men#25) - Arnold was really afraid that the Executioner would kill them if they failed. Knowing that Captain America cared about the security of the experiment, Lupa and Arnold unleashed their men to set traps for Captain America. Arnold disguised himself as a waiter and drugged Jim Slade. Then Lupa and Arnold brought the inventor to the zone of the experiments of the cannon. Arnold and Lupa questioned Slade, but he refused to speak. He was surprised by Bucky's attack, but Lupa Lupoff knocked the young hero down. Arnold was happy because Bucky's death would have saved him from the Executioner. The two spies were attacked by Captain America. Arnold was knocked down, and shortly after the Executioner, his wife, shot at him, because he failed the mission. Lupa killed herself after finishing off Arnold. Lupa Lupoff and Arnold had a group of at least 7 men who helped them. It is unclear if they were professional spies or only mercenaries or hired thugs who lived in Las Vegas and/or Nevada. (Young Men#25) - When Lupa and Arnold knew that Captain America cared about the security of the experiments, they gathered the group of spies and set some traps to kill Captain America. Two of them were present out of the restaurant where Lupa captured Slade, and they saw Captain America following Lupa's car so one of them shot at the hero with the shield. Captain America stopped them and--after some hits--convinced them to say where Slade was. Two other men set an explosive trap on the street and had it explode under Captain America's feet. They believed the hero dead, but the shield absorbed the impact and Captain America survived. (Young Men#25 - BTS) - Jim Slade invented the Atomic Cannon. He tested the cannon in Nevada. While he worked in Nevada, he met Lupa Lupoff and fell in love with her. He was the only man to know how to build the cannon. (Young Men#25) - One day, at the Atomic Zone, he met Captain America who was taking care of the security of the project. Slade showed Cap a photo of his girlfriend. He left for Las Vegas. In Las Vegas he met up with Lupa Lupoff. She tried to get him to talk about the cannon, but he didn't. He was drugged by two spies and brought to the zone of the experiments and bound to a cactus. His loyalty was strong, and he didn't reveal anything about the cannon. Bucky saved him the first time Arnold was trying to kill him. The second time, Captain America saved both Jim and Bucky. Jim was sad to see Lupa dead, because he loved her. They left the zone and shortly after an atomic explosion hit the zone.